So far this season, Cubs starters rank 10th in WAR as a group. For a club hoping to win a tough Central division, that might be less than ideal. Still, it seems workable. Fine for a contending club. Unfortunately for Chicago, 10th is not the rotation’s rank relative to other rotations — by that measure, they place 24th — but rather compared to other, individual starters. Stated differently: as a group, Cubs starters have been outperformed by nine major-league pitchers. That seems less workable. Less fine for a contending club. Only six clubs (the Orioles, Padres, Rangers, Reds, Royals, and White Sox) have received less production from their rotation and none of them are threatening to win a championship this year. It’s true that the Cubs have some pretty good starters — Yu Darvish, Kyle Hendricks, Jon Lester, and Jose Quintana have all authored multiple above-average seasons — but Darvish has been hurt or pitched poorly, Hendricks and Quintana have been inconsistent, and Lester appears to be benefiting from a combination of luck and defense rather than his own skill. Mike Montgomery has been solid as a fill-in, but free-agent signee Tyler Chatwood has been a disaster, with nearly as many walks as strikeouts. As it stands now, the Cubs are on pace to field their worst rotation ever. The graph below shows both the Cubs’ pace as well as their projections compared to full-season totals over the last 45 seasons. The chart is actually misleadingly positive: two of the seasons (1981 and 1994) that the Cubs are projected to beat were shortened by strike. 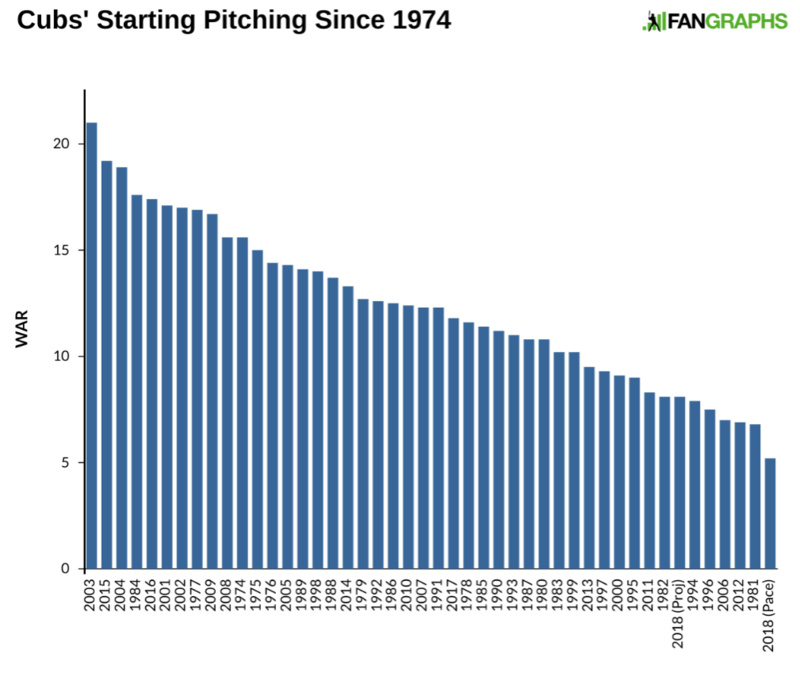 The 3.0 WAR the Cubs’ rotation currently possesses is the team’s lowest first-half total going back to at least 1974, and while the starter/reliever splits aren’t perfect before 1974, this might actually become the worst rotation by WAR in Cubs franchise history if they don’t improve in the second half. That’s really hard to believe given the talent level of the Cubs’ pitchers, but thus far, that’s where things stand. There are several reasons one might be suspicious about these claims regarding the current rotation. The first is that the Cubs are actually good at preventing runs. By RA9-WAR, a version of WAR calculated with runs allowed instead of FIP, the club ranks 12th in baseball. That number accounts for defense, as well, and you could say it’s actually fine that the rotation has been bad because the team’s defense is very good. If the focus is on overall run-prevention — and it should be — then the rotation (with the assistance of the defense) has been about average. Add in a solid bullpen, and you have a club that’s among the top 10 in terms of run-prevention. There’s also the distinction one might make between performance to date and expected rest-of-season performance. The former isn’t wholly predictive of the latter. After all, our projections put them 11th among MLB staffs with 5.0 WAR for the rest of the season. If the staff had pitched to that pace in the first half, they would have around seven wins right now, still in the bottom half of baseball but much better than where they are currently. That leads to the question of whether the Cubs’ projections are reasonable. In the table below, we see the Cubs’ starters pitching stats since the beginning of the 2017 season, as well as the projections for the rest of the year. Are the Cubs Pitching Projections Reasonable? On the ERA side, the numbers overall even out pretty well. Hendricks, Lester, and Montgomery are ahead of the projected ERA, so maybe they can keep that going. Chatwood and Quintana are behind, meanwhile, with Darvish coming in about equal. Over on the FIP-side, every pitcher but Montgomery has a projected FIP lower than his recent track record. For the most part, the FIP and ERA end up pretty close together on the projections. If Cubs pitchers can hit their projections on the FIP portion, they might actually be able to beat their projections for ERA given the quality of the team’s defense. That’s the good news. Yu Darvish: The Cubs’ big free agent signing still hasn’t thrown off the mound since attempting a return from the disabled list on June 28 and hasn’t pitched in an MLB game since May 20. Tyler Chatwood: The Cubs’ smaller free-agent signing has recorded more walks and hit batters total than strikeouts, and he hasn’t gotten any better as the season’s wore on. Mike Montgomery: In his first five starts of the year, he put up a 1.21 ERA and 3.55 FIP. In his last four starts, though, his numbers haven’t been quite as good, with a 6.00 ERA and 5.10 FIP. Over his last two starts, he’s struck out just three batters. The Cubs aren’t likely to receive definitive answers on any of the pitchers listed ahead of the trade deadline. They actually have to go beyond their current group within the first weeks after the All-Star break due to a doubleheader on Saturday. Luke Farrell is expected to make Monday’s start. Most of their previously strong farm system is either on the major-league team or playing for the Yankees (Gleyber Torres), Tigers (Jeimer Candelario), or in the White Sox’ system (Dylan Cease, Eloy Jimenez). The Cubs’ highest-ranked prospect on Eric Longenhagen and Kiley’s McDaniel’s updated prospect list is Aramis Ademan, a 19-year-old shortstop struggling to hit in High-A who doesn’t appear among the top-100 prospects anyway. The pitching options out there probably aren’t going to be great, but they might be better than what Chicago currently has. Nathan Eovaldi, Marco Estrada, Matt Harvey, and Lance Lynn probably fit the bill for the type of pitcher the Cubs should be targeting. The team, as presently constructed, is still a pretty big favorite for the NL Central even if the Brewers do make a big move at the trade deadline. If the team takes care of business against the Cardinals — against whom they play eight games in the next 10 days — they will enter August with even more secure footing in the division. The team might have a tough time trying to out-defend and out-mash their opponents in October, but even after a disastrous first half of starting pitching, the team is in good shape to get to the playoffs for the fourth straight season, a feat never before accomplished by the franchise. We hoped you liked reading The Cubs Are on Pace for Their Worst Rotation Ever by Craig Edwards! I’m curious what positive regression might come the Cubs’ way. Every starter, with the exception of Darvish, has outperformed (some by a lot) their xFIP. Positive regression assuming that the current underlying FIP stats aren’t the “true” talent level of the pitchers mentioned. The BABIP will probably regress the other way, true. Given the defense, pitchers currently on the Cubs should expect a better BABIP than their career averages.